Lil' Bits "Farmer's Market" helps you to enhance your layouts and cards with these premade elements and word strips. Use them for a theme idea, add a little humour to your card or layout and just make it a little easier to create! 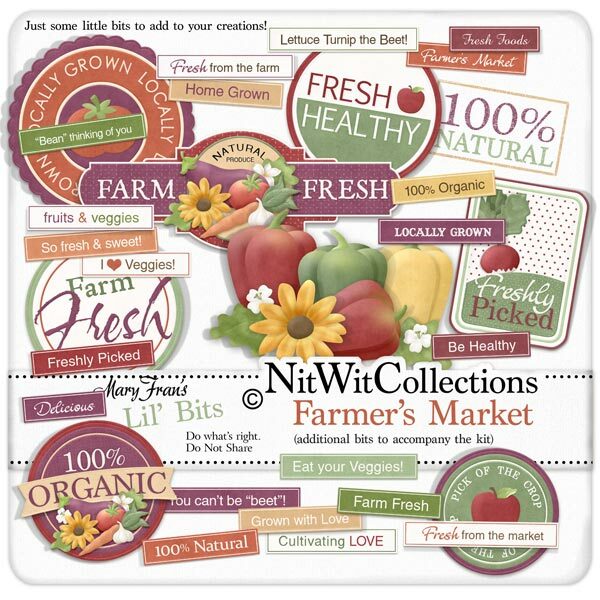 These digital elements are NOT included in the FQB "Farmer's Market" Collection so don't pass these by! 1 Label - "Locally Grown"
1 Label - "Farm Fresh"
1 Label - "Pick of the Crop"
1 Label - "100% Organic"
1 Label - Freshly Picked"
1 Sign - "Farm Fresh"
1 Stamp - "100% Natural"